I Love You More Than Carrots: Potty Training is A Lot Like Negotiating With Terrorists. 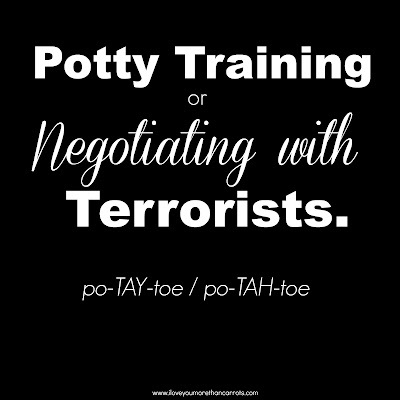 Potty Training is A Lot Like Negotiating With Terrorists. 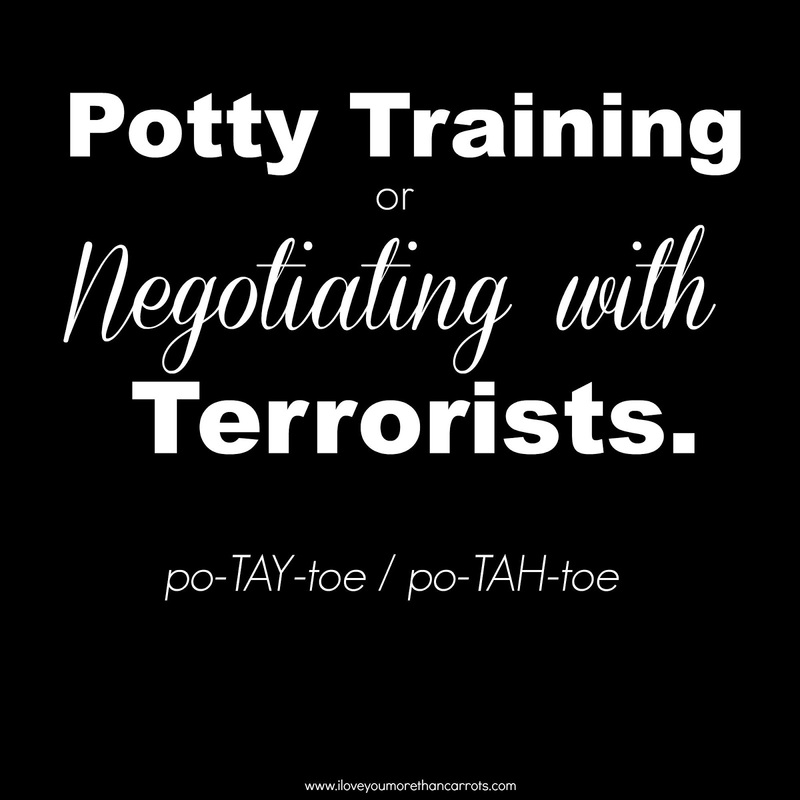 Potty training toddlers is a lot like negotiating with terrorists. Boundaries are pushed. Threats are made. Spirits are broken down slowly and painfully. Embarrassingly enough the spirits in question are your own, not your toddler's. Then there's the begging, pleading and haggling quickly followed by a call or two home to the Motherland. And by Motherland I mean, the land in which your own Mother lives (not only for reassurance that you're not ruining your toddler but also a reminder that you've already been through this once and come out the other side better, saner and with forty-extra dollars in your pocket each month). Toddlers make it look so easy- at least the interrogation they come at you with while you're sitting on the toilet for the first (and likely last) time that day. After all, potty training is simply giving them a taste of their own medicine! What could be so hard about that? Spoiler alert: they do not like the taste of medicine. That medicine, cough medicine. No dice. No toddler likes chatting nonchalantly about their bowel movements much less being forced against their will to do them somewhere other than the confines of their own pants. Me: If you pee in the potty, I'll give you 1 candy pumpkin! Me: If you pee in the potty, I'll give you 1 candy pumpkin and a sheet of Spiderman stickers! Three Year Old: No fank you. Me: If you pee in the potty, I'll give you 3 candy pumpkins, a sheet of Spiderman stickers, the keys to my Suburban and you can be the Executor of Mommy and Daddy's will, OK? Just PLEASE, PLEASE, pee in the potty! I'd like to take a minute to blame my first child for making potty training look like a goddamned walk in the park. Four days on that roller coaster of emotions and we rid ourselves of every diaper in the house and never once looked back. Shame on me for thinking just once that the second time around would run just as smoothly. My biggest piece of advice this time around? Find your child's love language and run with it. After all, that's really what potty training comes down to. Finding The Great Motivator. With my first son it was stickers and it was the award-winning combination of the Three Day Method and various charts and stickers that ultimately led to our success. With my second child it wasn't nearly as simple. I tried everything- stickers, special quality time, the ever-popular M&M and nothing motivated him. Not a thing. The lack of finding The Great Motivator eventually led to The No Attending of The Pre-school as the one rule regarding school readiness was the big PT (Potty-Trained). I felt defeated. I questioned myself again and again, "what am I doing wrong?" And then I cracked the tiny terrorist code. It wasn't just any candy he wanted. It was the luxury dark chocolate. DOVE Mint and Dark Chocolate squares. If asked, I'd bet he would now solve world peace AND figure out how to pay our national debt for just one back of those deliciously expensive chocolate morsels. He certainly learned how to effectively use the potty in record time once we introduced those into the equation. Before last week, my husband would have disowned me should I have willingly spent $45 on chocolate from CVS. He's singing quite the different tune now that our 3 year old has been successfully potty trained using said over-priced chocolate. Never, ever underestimate the power of the DOVE Promise. As I was saying earlier, potty training a toddler really is a lot like negotiating with terrorists. Demands may be completely irrational but once satisfied, you both walk away happier... and with dry pants. Must be nice! We've been trying to find The Great Motivator for our FOUR YEAR OLD for years now, and we still haven't cracked the code. Turns out, no positive reward trumps his fear/irrational need to poop on the toilet. I'm at my wit's end and there's no end in sight. But congratulations to you on potty training #2!! We're currently on track for our #2 (18 month old) to be potty trained before our #1 (four year old). Seriously. Ethan was so easy to potty train. Gabe is giving me a total run for my money, and I've tried stickers, candy, setting a timer and putting him on every so often...even a fun potty that lights up and sings! Nope. Not into it. Haha!! Kennedy was definitely of the terrorist variety. I wish she even had a love language and Great Motivator. But it happened eventually.... you know, 7 months later. And man, I will do a lot for dark chocolate, too. So I totally get it. I always say it's a good thing I had my second child before I tried to potty train my first. Had I tried to potty train my first child before having the second... well, there would be no second child.